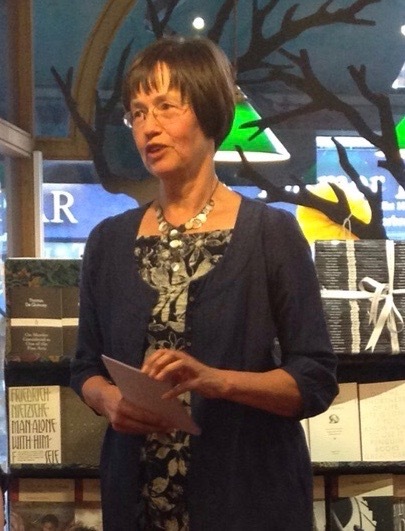 Marion Molteno’s writing reflects the breadth of her life experience. She grew up in South Africa where she was active in opposition to the apartheid regime. She lived in Zambia at a time of profound social change, has pioneered educational projects in multi-ethnic communities in the UK, and worked for Save the Children in many of the poorest areas of Asia and Africa. Her latest novel, Uncertain Light, is set in the world of international aid workers, much of it in Central Asia in the years following the sudden collapse of the Soviet Union. If you can walk, you can dance, the story of a young woman’s life on the run across frontiers and cultures, was awarded the Commonwealth Writers Prize for the best book in the Africa region, and was selected for the top 20 books in the Women’s Writers Festival in New Zealand. A Shield of Coolest Air, set among Somali asylum seekers, won the David St John Thomas Award for fiction. Somewhere More Simple is set on the Isles of Scilly and explores relationships among outsiders in a small community cut off from the mainland. Her short story collection, A Language in Common, reflects the experiences of South Asian women in Britain in the 1980s, and has been translated into Panjabi, Urdu and Bengali. She has written and lectured on language, education and development. The books which grew out of her experience with Save the Children have been translated into many languages and used across the world. She studied Urdu with the scholar Ralph Russell, and edits his writing on Urdu literature. It starts when an Indian humanitarian worker is taken hostage in Tajikistan during a civil war – and the story follows those closest to him as they try to come to terms with what has happened. It was inspired by years of working with Save the Children in countries across Asia. But essentially – like many good stories! – it’s about love, and loss, and what it means to be human. The Indie Book Award – what is it? It’s an international award for books published by independent publishers. It’s run from the US but gets entries from all over the world. 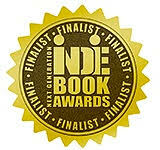 Uncertain Light is a finalist in the general fiction category. They also give awards for specific categories: thrillers, science fiction, children’s fiction, etc. Publishing these days is dominated by the giant conglomerates, yet there are so many independent publishers producing really good books, so it’s great to have these awards to recognise that. Smaller publishers are often more willing to take risks – give a space to more original writing – and that means they often come up with winners. Uncertain Light is published by two independent publishers, both of which are innovators, in different ways. In South Asia my publisher is Speaking Tiger Books. They are remarkable – they have only been going a year but they have an impressive list already – 70 books, with a broad range of voices: a critical edge in non-fiction, new voices in Indian fiction, and some very distinguished authors, both Indian and international. I’m honoured to be in their company. Uncertain Light is part of their International Fiction series. In the UK and on e-book, my publisher is Advance Editions. Its founder had the idea of inviting people to read final drafts on-line and give the author their comments, so for two months before Uncertain Light was published I had a chance to think about those reader responses before I finalised the manuscript, and I think that helped me sharpen it. How did you start writing, and was there a period of struggle as a writer? The inspiration for my writing is the people I’ve got to know through living in different countries and in different cultures. I grew up in South Africa, left after being involved in activism against the apartheid regime, and lived in Zambia for a number of years. Since the mid 1970s I’ve lived in London, always working in mixed cultural settings. Then for thirteen years I worked for Save the Children, travelling to 30 countries where we supported projects with vulnerable children. I started writing in my mid 30s. I was running English classes for women from South Asia who had come as adults to live in the UK, and learning about their lives was the stimulus for a collection of fictional stories, A Language in Common. That did well, and gave me the confidence to write my first novel, A Shield of Coolest Air, which was set among Somali refugees. Then things began happening. My novel got great reviews – I was getting letters from readers – one of my short stories won a prize, and then so did my novel. By the time my second novel, If you can walk, you can dance, won a Commonwealth Writers’ Prize, I understood – This is something I can do. I can tell stories about people, fictional people but inspired by real life, people my readers can get involved in, and feel they know. So I have kept on doing it. Struggles? Well, I had a demanding job and a family, so there was a constant struggle to find time. I’m sure many of your readers have the same challenge. I did it by waking at 5 a.m. and writing for a couple of hours before the working day started. But the real struggle was to find a publisher. I dreamed – as possibly all writers do – of being picked up by a major publisher. But now I have great independent publishers, and a growing following of readers across the world, which keeps building. Uncertain Light has a lot of Urdu poetry in it. What got you interested in Urdu poetry? I was teaching people from India, so I began learning Hindi. Then I met the Urdu scholar Ralph Russell and saw what an extraordinary language teacher he was, so I switched to Urdu so that I could learn with him. I just wanted to be able to speak, I had no intention of studying the literature, but I was intrigued by the way he often quoted couplets of Urdu poetry, which he would then translate for me. That was poetry as a real, living thing, and it drew me in. So I asked him to teach me some, and it went on from there. In Uncertain Light the central character, Rahul Khan, grew up surrounded by Urdu poetry and he uses it in the same way, to reflect on things happening in his life. But there’s another way poetry comes into the story. A lot of the action is set in Tajikistan, where the language – Tajik – is Persian by another name. When I first went there I would hear words I knew, because Urdu poetry derives from Persian and uses a lot of Persian words. Tajiks love poetry in the same way that Urdu speakers do, but during the Soviet period there was an attempt to break that tradition. The Persian script was banned – people were no longer allowed to read it, yet they kept it alive through memory. Here were stories waiting to be told, and poetry was clearly going to be part of it. You’ve also just had a book published about Ghalib. What has been the response to that, in India and abroad? Actually it’s not my book, it’s Ralph Russell’s, but I edited it after his death from his writing and translations. It’s called The Famous Ghalib: The Sound of My Moving Pen, and it introduces Ghalib to people who don’t know Urdu. The response in India has been great – it has sold nearly 1,000 copies in just a few months. 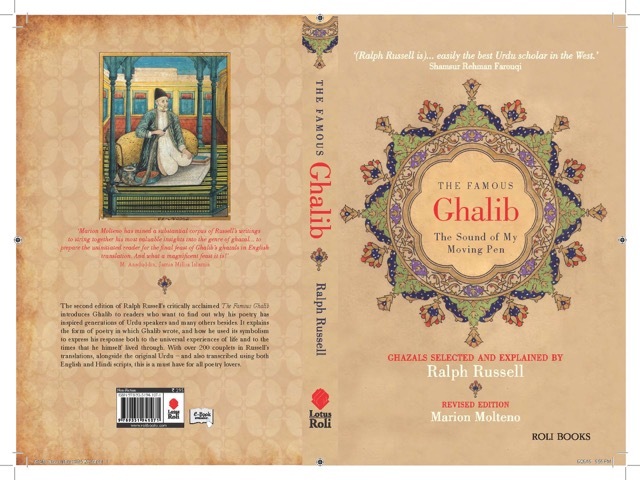 It definitely fills a gap – there are many books about Ghalib but Ralph had a unique ability to explain his poetry to people who know nothing about it, yet it also works for people who know a little about Ghalib, might have heard his poetry sung, but can’t read Urdu. There was a YouTube interview with me about the book, as part of the on-line LitFestX, which got over 5,000 views – one of the highest of any of the LitFestX interviews. You can listen to it on YouTube: http://bit.ly/1SgUYcb. The publisher, Roli Books, is currently making distribution arrangements for it in the UK, and we have a launch lined up for October. But meanwhile many people who have read Uncertain Light have told me they loved the poetry in it, and want to know more about it, so this book is perfect for them. I’ve just done a session on it at the Wenlock Poetry Festival, and people were very appreciative. Please share your memories of working with the legendary Ralph Russell. Well, first, what made him ‘legendary’ in Urdu speaking circles? 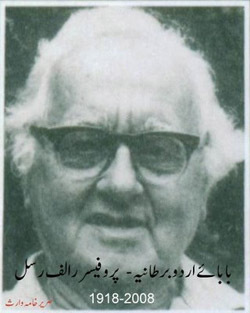 Essentially, that he was an Englishman who became an outstanding scholar of Urdu. Almost every Urdu speaker he met was astonished at the excellence of his Urdu. He had almost mother-tongue competence – he loved speaking it, and he never stopped wanting to learn more. He was admired for the rigour of his scholarship, his skill as a translator, his ability to make Urdu literature accessible to English speakers. He spent a lot of time in India and Pakistan, and knew many of Urdu’s best known writers. I first started working with him as a co-teacher. He was running Urdu courses for English people who worked with Indian or Pakistani communities in the UK, as teachers, social workers etc. If anyone could get a group together who wanted to learn Urdu, he would go and teach for free. Classes started springing up in cities all over the UK and within a few years he couldn’t keep up with the demand, so he pushed some of his more advanced students into teaching alongside him. When we said we didn’t speak well enough yet to teach it, he said, ‘Just stick to the language in Part 1 of my course and you’ll be fine.’ We did that – and we discovered that teaching is a good way to improve your own accuracy! Later he left the teaching to others so he could concentrate on his work on literature. He had always wanted to make Urdu literature accessible in translation to a wide audience, but much of what he had written had never appeared in book form. I helped him edit the books he was now producing. Being so deeply immersed in the literature, he sometimes didn’t realise what needed to be explained to someone who knew very little about Urdu, so one of my roles was to point out places where he needed to write more, or revise what he had written for new readers. At the same time he was reading every draft of every novel I wrote. He had a wide appreciation of literature – not just English and Urdu, he had studied Greek and Latin literature and read a lot of European literature in translation. Without his encouragement I wonder if I would have had the confidence to think that anyone might want to read what I wrote. When I was having difficulty finding a publisher he dismissed it as unimportant. The important thing is to keep writing, he said – they’ll be reading you long after more fashionable writers have been forgotten! He gave the same kind of morale boost to many of his students and friends, each in their own area of work. Even if you know it’s over the top, it’s wonderful to have someone believe in you. Uncertain Light is the only one of my books he didn’t live to read, but he was there in the beginning. We talked a lot about the poetry in it, and the life story of the fictional Tajik poet, Rahman Mirzajanov. You have spoken at a number of literature festivals in India and Pakistan. What has your experience been? What do you like and dislike about such gatherings in the sub-continent? The answer to that is simple – I’ve loved it. 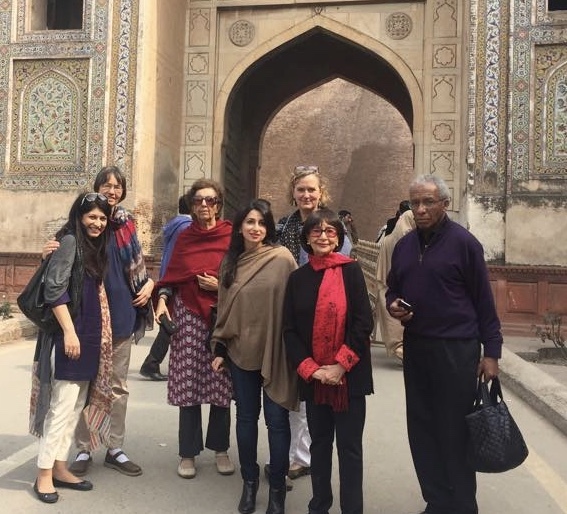 I’ve been to Jaipur, Hyderabad and Lahore, and the best thing about them all is that they are free – so anyone can go, and all the festivals I was part of were flooded with young people. They provide great educational experiences, and there were lively debates about current issues. With a regrettably restrictive political culture in several countries in South Asia, they play a vital role in creating a space for thinking, critical citizenship. I learnt a huge amount, discovered many interesting writers I had never heard of, and feel privileged to have had the chance to talk to so many people about my books. I heard minor quibbles from some participants, but I don’t share them. The only serious negative point I have heard is that the organisers are in hock to big corporations from which they get funding. I don’t know enough to comment on their funding sources, but in principle I’d say this is the price for not charging entrance fees. It costs a fortune to run such a festival, and someone has to pay. This is nothing new – the arts have always needed patrons – and while the sponsors (obviously) got some publicity, I saw no signs that the range of topics was ideologically affected. Festivals in the UK raise funding too but they find it difficult to raise enough, so they charge for every session – often quite high fees – and that makes them a quite different social phenomenon. For instance students who are on very limited incomes wouldn’t be able to consider going to the major literary festivals. Having to charge for each session also constrains festival organisers about who they will take on – they have to sell enough tickets to cover costs, so they really only want big name authors. Of course there are exceptions – the Wenlock Poetry Festival I’ve just been at was an example of a festival that had a great mix of well known and completely unknown poets. What prompted you to found South London Refugee Project? What do you think about the current refugee problem in Europe? In the English classes I was organising I and other teachers got to know people who had fled to the UK from horrendous situations in their own countries. Not knowing English was only one of the many obstacles they faced, so there was no way we could just practise English and ignore all their other problems. Getting together with other teachers, organisers, social workers etc, support groups were set up in different parts of South London. Some groups raised funding to employ a case worker; most relied entirely on volunteers. Earlier immigrants from countries like Somalia, Afghanistan and other countries acted as interpreters while English people were befrienders and did the organisational support. About the current refugee problem in Europe – what to say? It’s huge, and it’s leading to a polarisation of attitudes. There’s a surge of racist, anti-immigrant political parties, but there are also many groups who are responding with humanity, and helping in practical ways. I’m part of one that’s just getting going in my own part of London. And of course, by far the bigger numbers of refugees are not in Europe but in Syria’s neighbouring countries. They are carrying a huge burden. What comes easier to you–writing fiction or doing translation projects like the one you have done on Ghalib? Writing fiction is what fires me, and keeps me going for hours without any awareness of time passing. But I’ve always done non-fiction writing as well, and in lots of ways the two seem to go in tandem. Writing practical things for my work – reports, proposals, newsletters – is how I learnt to communicate clearly, to people with little time and who knew little about the subject. That was an excellent discipline, and helped me become my own most rigorous editor in my fiction. In one way non-fiction is easier because there is an external purpose. There’s a question I am being asked to answer, or an argument I need to make, or an aspect of culture I want to explain, so I know what needs to be said. Whereas with fiction – it comes out of the air, it can be anything; and typically I spend months dancing around with characters and scenarios before I really understand what my novel is going to be about; then I go back to the beginning, and start again. I’m spending most of my time talking to groups about Uncertain Light, and I won’t let myself think about a new novel until I am confident that it is sailing on its own! Meanwhile I’m writing a blog about some of the experiences that Uncertain Light has landed me in. It’s been quite a journey. 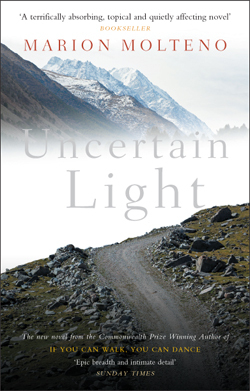 Uncertain Light is published by Speaking Tiger Books (South Asia) and Advance Editions (UK & e-book). She regularly posts on FaceBook about new events related to Uncertain Light. Posted in Authors and tagged Ghalib, Marion Molteno, Ralph Russell, Uncertain Light, Urdu. Bookmark the permalink.